Also known as zonula occludens, tight junctions are found in epithelial and endothelial cells and primarily function as diffusion barriers. 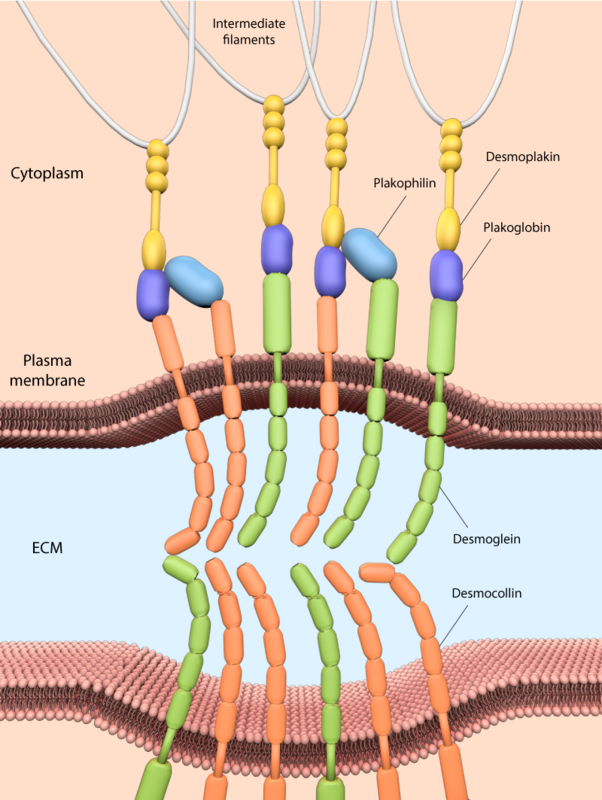 Integral membrane proteins commonly associated with tight junctions include; claudins, occludin, tricellulin and junctional adhesion molecules (JAMs). These proteins facilitate the formation of the anastomosing membrane strands that comprise tight junctions . Adherens junctions link actin filaments between cells. This diagram specifically depicts adherens junctions (red rectangles) connecting actin filaments (red lines) across polarized epithelial cells. In these cells, this results in the formation of contractile bundles of actin and myosin filaments near the apical surface – this forms a structure called the adhesion belt (arrows). Other junctions termed desmosomes (large blue rectangles) and hemi-desmosomes (small blue rectangles) link intermediate filaments (blue lines) between cells. Adherens junctions regulate cell shape, maintain tissue integrity and translate actomyosin-generated forces throughout a tissue . A key component of adherens junctions are the transmembrane glycoproteins cadherins, which bind the intracellular proteins p120-catenin and β-catenin, after which α-catenin is recruited by β-catenin. 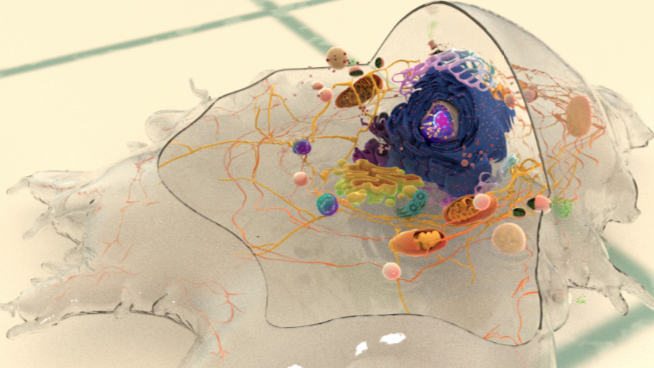 A vast network of adhesion receptors, scaffolding proteins, actin regulators and signaling proteins regulate the formation of this complex, via a complex network of interactions, which is currently being characterized and has been named the cadhesome . The adherens junction is a type of stable cell contact, or anchoring junction, that keeps cells in a tissue together by forming an interconnected lateral bridge that links the actin cytoskeleton of neighboring cells (reviewed in ). 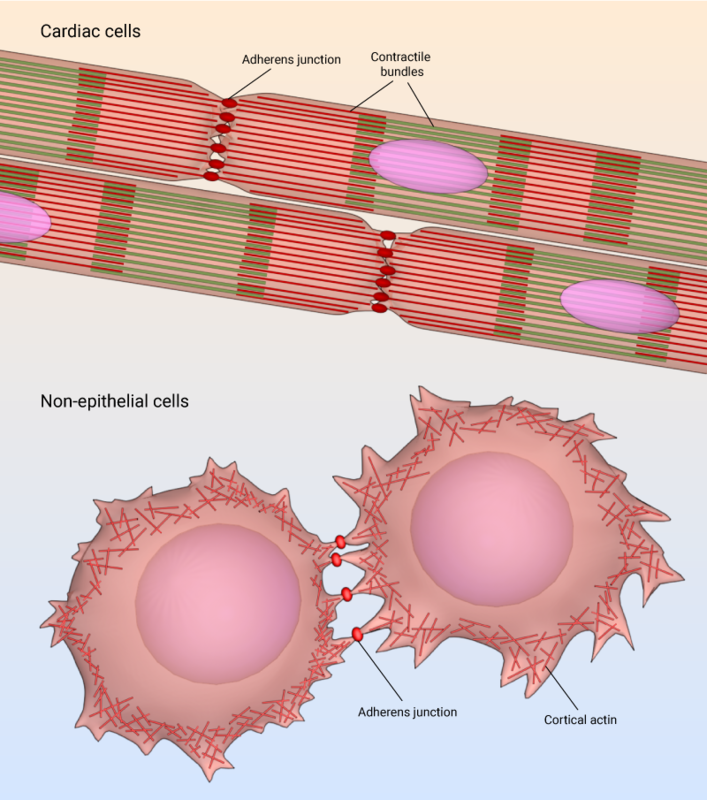 Adherens junctions come in many forms: In cardiac cells, contractile bundles are anchored by adherens junctions , while in nonepithelial tissues, adherens junctions link cortical actin filaments between cells (see “cell cortex”). Adherens junction in cardiac cells and non-epithelial cells. In polarized epithelial cells, the most obvious feature of the actin cytoskeleton is the contractile bundle of actin filaments usually located near the apical surface; this circumferential belt (aka adhesion belt) is linked from one cell to another through the extracellular domains of a continuous band of transmembrane molecules belonging to the cadherin family , along with other anchoring proteins (e.g. catenins, vinculin, and α-actinin) . However, recent investigation of cell-cell adhesion using super-resolution microscopy has uncovered new facts about the existence of the ‘adhesion belt’. 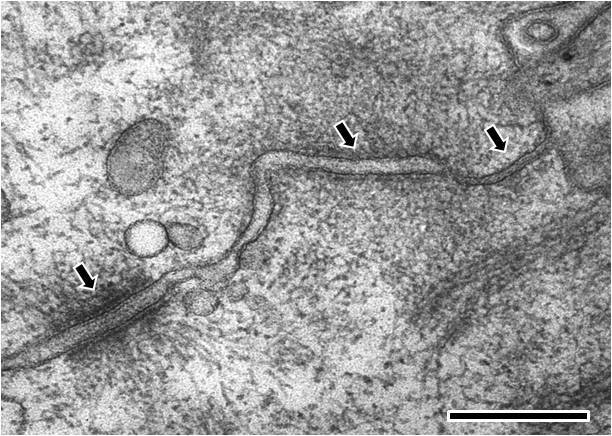 Conventional microscopy shows that clusters of E-cadherin merge to form a thick belt along the cell membrane between adjacent cells. The binding of individual E-cadherin proteins was thought to drive adhesion, with clusters formed in an adhesion- dependent manner, before merging and becoming uniformly distributed over time. 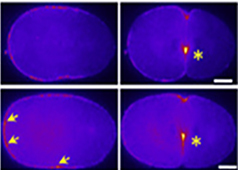 This has long been the prevalent notion, based on conventional microscopy, which is limited in its ability to clearly visualize structures as small as the adherens junction or E-cadherin cluster. Super-resolution imaging of the adherens junction revealed that cell-cell adhesions are initiated by small clusters of about five E-cadherin molecules. These distinct, evenly-sized, precursor E-cadherin clusters were observed in both incipient and mature cell-cell adhesions. As the adhesion develops, more E-cadherin molecules are recruited from neighbouring cells, leading to the clusters increasing in density. At the nanoscale level, it became clear that E-cadherin clusters never increased in size or merged to form the ‘adhesion belt’. Instead, the actin cytoskeleton fences in E-cadherin clusters, preventing them from merging. The actin-delimited E-cadherin clusters therefore represent the building blocks of adherens junctions . The actin and associated myosin are positioned to sense tension and to brace the cell . Contraction of the actin network also provides motile forces for tissue morphogenesis and cell migration . The cell is orientated such that the top right hand corner is apical and the bottom left hand corner is more basal.From left to right; the first arrow points to a desmosome with dense desmosomal plaques seen either side of the intercellular space of approximately 240 angstroms in width, the second arrow points to an adherens junction with an intercellular space of approximately 200 angstroms and the third arrow points towards a tight junction that shows close apposition of the plasma membrane leaflets, as inferred from the absence of an intercellular gap. (Scale bar 250 nm). These junctions link intermediate filaments (IFs) to the plasma membrane and in doing so provide mechanical stability to cells, which is particularly important for tissues and organs under high mechanical stress, such as the myocardium, skin, and bladder. Desmosomes comprise desmosomal cadherins (desmogleins and desmocollins) that facilitate linkage between apposing cells via their extracellular domains and bind other desmosomal components intracellularly via their cytoplasmic tails. Cytoplasmic desmosomal components include plakoglobin and plakophilins, which in turn bind intermediate filaments via desmoplakin . In vertebrate epithelia, all three of the aforementioned junctions have defined spatial organizations, with tight junctions located most apically, followed by adherens junctions and lastly desmosomes . Each type of junction has a distinct ultrastructure, which can additionally vary in appearance dependent on cell type and morphology. 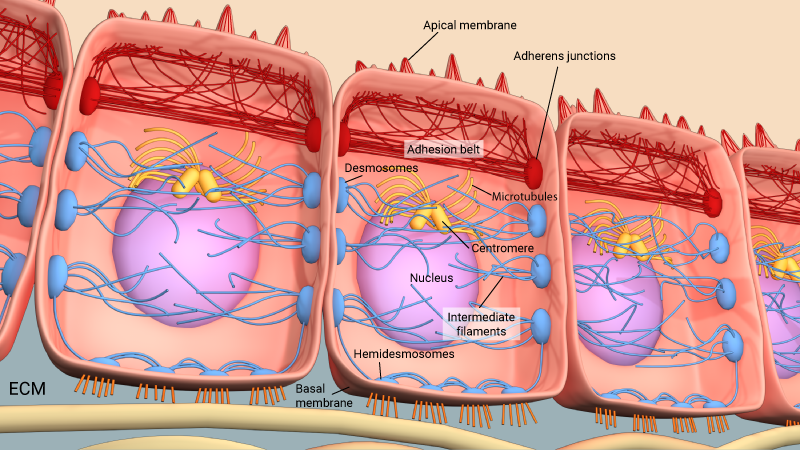 Desmosome junctions link intermediate filaments to the plasma membrane, and consist of desmosomal cadherins (desmogleins and desmocollins), and cytoplasmic desmosomal components such as plakoglobin and plakophilins, which connect the cadherins to the IF via desmoplakin.